Would more school police officers and security monitors help? What about requiring students to use clear backpacks? Or installing security booths at school entrances? And maybe — just maybe — should teachers be allowed to carry guns? As school shootings continue to terrorize campuses nationwide, these are some of the questions vexing administrators, principals and police as they grapple with how to keep students safe. The Valentine’s Day shooting at Marjory Stoneman Douglas High School in Florida, which left 14 students and three faculty members dead, only intensified their fears and search for answers. 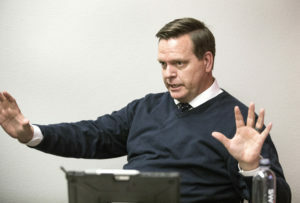 Five Clark County School District principals, two high-ranking members of the district’s police force and the chief academic officer joined The Nevada Independent on Tuesday for a roundtable discussion about school safety. The wide-ranging conversation offered a glimpse into the grim realities facing the people charged with protecting innocent lives in the age of mass-casualty events. They worry about when, not if, it will happen. It’s a fear rooted in close calls and the knowledge that it could happen anywhere. In November 2016, school police arrested a Desert Oasis High School student suspected of building bombs in his garage. Several students have been arrested this year for allegedly making threats, including a Rancho High School student on Wednesday and a Cadwallader Middle School student on Friday. Police said the Rancho student, a 16-year-old boy, called a district office several times and claimed to be planning a shooting. So while Florida families bury the latest school shooting victims and angry, traumatized students demand change across the country, Clark County education officials are looking inward to determine what they can do to prevent more bloodshed and also curb rising levels of violence inside schools. Thousands of violent situations involving students play out on Clark County campuses each year, with hundreds of violent acts against staff members, and school officials say those incidents are only increasing in frequency. “Kids won’t learn if they don’t feel safe,” Warnick said. The school organizational team at Grant Sawyer Middle School made a $40,000 decision this year to install two security gates. The advisory group — made up of parents, staff members and one student — recommended using school-generated funds to bolster student safety. The Parkland shooting only reinforced Principal Greg Mingo’s belief that it was money well spent. “Before that, the middle schools that are our floor plan, they were wide open,” he said. The new barriers will reduce access points to the school and its students — a concern echoed by the principals. But it’s a tall order in a district where open-air campuses reign supreme. Shadow Ridge High School, for instance, has 42 doors that serve as entry points to the building, Warnick said. Other campuses, including Sierra Vista High School, share the same floor plan. Still, principals said there simply aren’t enough bodies to monitor all access points every minute of the day. For starters, the school police department’s manpower isn’t what it used to be. The force has dwindled from 149 full-time officer positions in its 2007-2008 budget to fewer than 132 this academic year, Ketsaa said. Those numbers translate to one police officer dedicated to each high school (but that doesn’t necessarily include magnet or career and technical schools) and a patrol division that visits middle and elementary schools to monitor activities. “As the district began to grow, we didn’t keep up,” Police Capt. Ken Young said. Schools can hire unarmed security monitors who serve as a force multiplier of sorts, adding extra eyes and ears to each campus. It comes with a $35,000 to $45,000 price tag per person, Anzalone said, but many schools have deemed extra monitors a necessary expense despite it dipping into funds for instructional services. The common theme among these ideas? Money. School officials have even looked into retrofitting classroom doors to make them more secure, but that alone could cost $20 million, they said. For a cash-strapped district that just dug itself out of an estimated $60 million shortfall, finding the money is no easy feat. 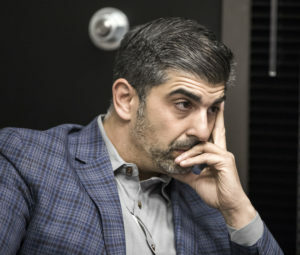 Anzalone, a Democrat who’s running to replace Rep. Ruben Kihuen in Nevada’s 4th Congressional District, said the infrastructure-related safety improvements may be reliant on federal funding. But the principals also aren’t discounting the state’s role in the matter. That means school safety enhancement could very well become a key part of education funding requests heading into the 2019 legislative session. 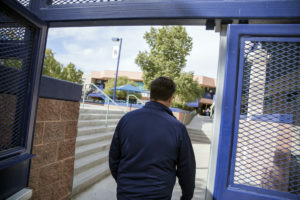 “My personal opinion is if we can spend hundreds of millions to bring the Raiders here, why can’t we spend $20 million to fix my doors so that my students are safe?” Eldorado High School Principal David Wilson said. Reducing the odds of a catastrophic incident, however, is only part of the school-safety equation. The other involves reducing day-to-day violence within Clark County schools: fights among students, attacks on staff and weapons on campuses. 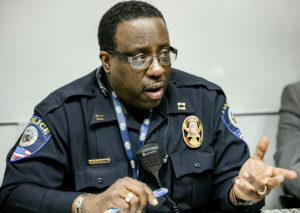 Principals from Eldorado, Shadow Ridge, Spring Valley and Sierra Vista high schools said a police officer from each of their campuses has been hospitalized this year with injuries sustained during an incident involving students. In Clark County, incidents involving student-to-student violence jumped from 3,781 in the 2013-2014 school year to 6,227 last year. That’s a nearly 65 percent increase. It’s a similar tale in other safety categories as well: Student violence against staff members increased from 178 to 647 incidents during that same time frame. Additionally, the number of weapons-related incidents at schools has tripled in recent years — from 264 in the 2013-2014 academic year to 804 last year. The daily skirmishes that can escalate into fist fights or worse have dampened students’ perceived sense of safety at school. “It’s heartbreaking as a principal when kids come to you and say, ‘I don’t want to be here anymore,’” Anzalone said. Wilson chalks up the increasing school violence to what he calls a “failed social experiment” — an initiative to decrease the number of expulsions, especially among minority students, who historically have faced that type of discipline at higher rates than their white peers. The Office for Civil Rights released a report in 2012 showing that black students were three times more likely to be suspended or expelled than white students. 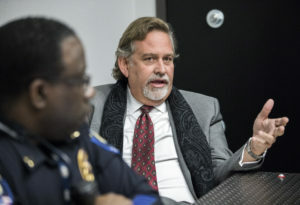 A year later, in 2013, a civil rights-related complaint was filed against the school district, Superintendent Pat Skorkowsky said. Wanting to create a more equitable environment and avoid costly punitive measures, the district made its expulsion criteria stricter, Skorkowsky said. But he acknowledged the discipline system may need some tweaks given the increasing level of violence within schools. It’s one of the topics being tackled by the district’s newly formed School Safety Committee, which started organically last fall with a group of concerned principals and has morphed into one that includes community members and trustees, too. So how can schools better deal with the handful of students prone to violent outbursts who repeatedly defy authority? Wilson has an idea: It’s a multi-layered plan that involves enrolling those students in an online education program and wrapping them in support services via a social worker until they can prove they’re ready for a comprehensive high school environment again. Wilson said his proposal would give troubled students hope for a return while putting them on a path toward graduation and maintaining campus safety. After all, school officials know life hasn’t been kind to many students in the district. They’ve experienced stressful or traumatic events — maybe the death of a family member, exposure to drugs and violence, physical abuse or persistent bullying — that can trigger negative behavior. Warnick understands this type of child on a personal level. Aside from being principal of Shadow Ridge High School, he’s also a foster parent for high-need children who have experienced trauma. He’s keenly aware that they could become some of the most troubled high schoolers based on their past. Too few mental-health workers nationwide doesn’t help the situation. The school district in November had 20 openings for school psychologists. While some school-safety ideas seem like no-brainers, others strike unease in the people tasked with running schools. President Trump this week suggested that certain highly qualified teachers should be allowed to carry weapons as a defense against school massacres. His comments support a position long held by the National Rifle Association. Under Nevada law, firearms and other dangerous weapons are banned from school property unless they’re in the possession of police officers or security guards. Principals also can give written permission for certain people to carry weapons on campus. The educators who participated in this roundtable discussion, however, largely balked at the notion of arming teachers. They rattled off a list of downsides: What if the teacher’s weapon gets stolen? What if the firearm accidentally discharges when a teacher is breaking up a fight? And is it fair to place that burden on teachers? “I’ve got teachers that can’t even keep track of their cell phones,” said Tam Larnerd, principal of Spring Valley High School. They expressed slightly more openness to the idea if the teacher was a former police officer or high-ranking military member who has had extensive tactical training. But even that poses strategic concerns from a law enforcement perspective. In the case of an actual school shooting, it could cause confusion when officers arrive and search for the gunman. Young, a seasoned school police officer, said the district is always looking for ways to minimize opportunities for harm. Ultimately, the educators agreed there’s no single solution that will guarantee student safety. But the conversations will continue. And so will the active-shooter drills — preparing for a day they hope never comes. This story has been updated with information from the school district police clarifying which schools have officers assigned to them.